This morning, I decided to subject myself to some creationist programming on one of the religious channels that every American gets with a basic TV package. I don’t know why I do this, but I consider learning what creationists do– and do both deceptively and wrongly–a great exercise in understanding my own epistemology. The most important thing to understand about creationism, whether it is the Kent Hovind, 6,000-year-old earth type or the more sophisticated intelligent design type, is the fundamental exercise is not understanding scientific findings. Instead, it is about protecting the authority of scripture from scientific findings. The Hovind types are about denying science, wile the ID types are more into a sort syncretism between the findings of science and the need to have faith. This same sort of syncretism exists with religious people who accept evolution, too, but the intelligent design types often are a bit more into making sense of scripture and science than the theistic evolutionists. So whenever you are subjected to creationist or intelligent design pontifications, you need to understand they are much more concerned with defending scripture against scientific findings than creating any kind of parallel scientific hypothesis that could ever compete with those of peer-reviewed science. This particular creationist segment was concerned about speciation, and it was definitely from the school of thought that a Kent Hovind would appreciate. Because biologists do not have a hard and fast definition of species– a strength of the discipline, if you ask me–creationists are able to play games with what a species is. The piece talked about how they accepted that all the breeds of dog derived from a wolf ancestor, but then it started getting dishonest. It showed how biologists think of lions and tigers as distinct species, but they can sometimes interbreed. However, unlike mixed breed dogs, the ligers are often sterile. The narrator of the piece didn’t seem to get that this sterility is how we know that lions and tigers are different species, because no scientist alive believes that two animals that produce offspring in which fertility is limited to this degree belong to the same species. Instead, the narrator skipped over this glaring problem and began to explain that breeds of dog and tigers and lions were obviously derived from the same kind, and the reason why ligers are often sterile is because of a sort of hyped up “evolution” that happened after Noah’s flood. It is certainly true that dog breeds are far more morphologically variable than lions and tigers are from each other, but dogs have a good reason for this morphological variation. They have some odd characteristics to their genomes that allow them to respond to selection pressures in rather dramatic ways. Thus, dogs vary a lot in terms of their morphology, but they don’t vary as much genetically as lions and tigers do from each other. Molecular evidence points to all extant dogs radiating within the past 15,000 years, and although some experts would put that date a bit further back, it is nowhere near the 4 million years estimated for the most recent common ancestor lions and tigers. I don’t know how creationists square this problem, except to say that mutation rates are so much higher in some of these “species” than in others. But the mutation rate you’d have to have to match the millions of years of divergence between tiger and lion lineages would not be biologically possible. I image that the genetic load from deleterious mutations would be too much to sustain either lineage. But that’s not what the creationists in this piece discussed. Instead, they came up with an entire theory called “polyphyletic decent.” The “kinds” of animal that came off the ark diverged into the things resembling species in phylogenetic trees that look a lot like the ones real scientists use to describe evolutionary relationships. However, unlike those phylogenetic trees there is no implication of connection between “kinds.” They are trees growing out of a single stem that diversified. Evolution is based upon monophyletic decent. That’s why the argument that creationists often make where they posit the absurdity of an organism giving birth to another species is quite ridiculous. All living things evolve out of a particular lineage. Nothing evolves out of it. Humans will always be great apes, which will always be Old World primates, which will always be simiiformes, which will always be haplorhines, which will always be euarchontoglires, which will always be boreoeutherians, which will always be placentalian, which will always be therian mammals. This is why so many taxonomists work hard to ensure that organisms are classified according to their descent. This descent can be traced through the morphology of the organism as well as its molecular biology. If the creationists were right about this “polyphyletic descent” hypothesis, then you would be able to find organisms for which one can find no DNA sequences in common with any other. And one has not been found yet. So creationists have a new thing to play around with. It will never gain acceptance among scientists. But that is not the point. The point of creationism is to defend scripture’s inerrancy against scientific findings. It is an exercise in defending faith, not in trying to understand that which the rigors of the scientific method has revealed. And once you understand this difference, it makes total sense why scientists don’t debate creationists. The two disciplines are trying to do entirely different things, which are not equivalent to each other. One is trying to understand the material world using measures and data that verified, while the other is trying to defend supernatural beliefs that can never be verified. I guess I go by the Bible and say by its fruits, it will be known. The scientific method has produced all the technological advancements that have made modern life what it is. It has increased our knowledge about our place in the world and in the cosmos. Defending scripture against what science has revealed has produced little but adhering the truly faithful to the religion a bit more strongly and made a few charlatans infinitely rich. But it has not advanced us one iota, and in this current epoch, it is holding us back from confronting global problems like climate change and mass extinctions. If you can deny evolution, which is quite obvious, then you have the intellectual skill-set to deny what climate scientists are saying. We live in an era of tribal realities. What one accepts as true depends upon which tribe one belongs. If you’re a conservative Christian in the United States, you have a different understanding of how the world is than virtually anyone else in the Western World. Part of the reason for this disconnect is that white conservative Christianity is losing the demographics battle in the United States. And in this loss in demographics is this tendency to turn to those ideas and individuals who might restore their former advantage. Belief in fundamentalist Christianity might somehow bring down the divine, which could restore it all with a miracle, and belief in Donald Trump might work out, too, because he will be nasty to all those people who are taking away this demographic advantage. Time will eventually remove this madness from our society, but while it is there, it will do some damage. And for the climate, we don’t have that much time. All I can do, then, is use my voice to make some sense to a few more people, and hope, the dismal tide turns sooner rather than later. Canis cedazoensis was an early species of the wolf-coyote-jackal tribe. It lived what is now the American Southwest and Northern Mexico until 300,000 years ago. It probably scavenged kills of bigger predators and lifted off the fawns of the various species of pronghorn. Conventionally, we believed that the lineage from which this jackal-like canid gave rise to the wolf, the coyote, and the golden jackal. We based these assessments on comparative morphology from fossil and subfossil remains, and it all made sense. These jackal-like forms entered Eurasia and Africa. They gave rise to the Xenocyon, the first wolf-like canid to evolve of this lineage. The Xenocyon gave rise to the dhole and the African wild dog. Then the actual wolves evolved in Eurasia, and they walked back into North America to found the Armbruster’s wolf and the Dire wolf. They spread to South America, and endemic North American wolves, Canis edwardii and the putative red wolf evolved out of an unrelated jackal-like line. The coyote descended from some sort of jackal-like canid in North America and a least a million years of evolution separates the coyote from the modern gray wolf. The most recent study that examined full genomes of various wolves, dogs, and coyotes revealed that the separation between coyotes and gray wolves happened only 50,000 years ago. This finding pretty much destroys all this thinking. We’ve conventionally thought of the lineage starting out with jackal-like forms that evolve into wolf-like forms, but the truth is we have a lineage that started out with jackal-like forms. Wolf-like forms evolved at least twice from this lineage, and jackal-like forms have evolved from wolf-like forms as well. What we’ve missed that just as the Xenocyon and the dhole and African wild dog have evolved into wolf-like forms in parallel to actual wolves, the real story of Canis is that there has been a constant tension between selection for wolf-like traits and jackal-like traits. The coyote is a wolf that has re-adapted itself to the jackal-like form. To become a jackal is to become a generalist again. To evolve towards the wolf is become an apex predator and be forced to hunt for large game to survive. What we know from the fossil record is the story of wolves and dogs and coyotes and their kin is that it began with “jackals.” Paleontology says that North America is where this story got started, but the oldest species in this lineage of dogs lives in Africa. I would love to know the full story. Canis cedazoensis is a creature lost to time. If we could see one, maybe we know some answers. Maybe we would see something very much like a black-backed jackal. Maybe it would answer some questions. And it would probably raise more. Yet more of the mystery to which we should humble ourselves. It began with jackals, and in the Anthropocene, it may end with them as well. The coyote and Eurasian jackal have continued to spread their range. The coyote is from from Alaska and Newfoundland to Panama– on its way to Colombia. The Eurasian jackal (the “golden jackal,” as it is normally called) spreads north and west through Europe. Both are generalists of the jackal type. Phenotypic plasticity and convergent evolution have played quite a game with this part of the dog family. Science is always provisional, and often takes just one profound discovery to turn over the apple cart. And oh, has it been turned! 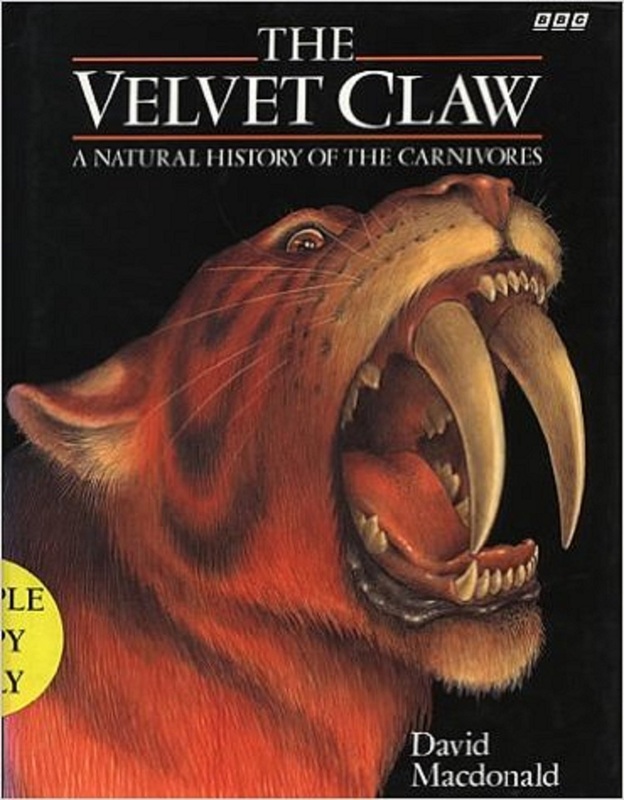 If you probably couldn’t tell from reading this blog, carnivoran evolution and natural history is one of my passions. Where did all of this get started? I’d say sometime in the mid-90s. I used to watch A&E’s old Wildlife Mysteries series on Thursday nights. These were mostly very high quality wildlife documentaries and a lot of them were BBC productions. Some of these films were shown in a series called “Carnivores.” It was about the evolution of the order Carnivora, minus the pinnipeds. And I loved it. The series was based upon the work of David MacDonald, a carnivoran specialist and conservation biologist at Oxford. In the UK, it was shown as “The Velvet Claw,” which is one reason I’ve had a few problems finding even clips of it online. And for a long time, all that we could see are short clips, but now, well, it’s been uploaded in full. Here is the entire series on Youtube. I don’t know how long it’s going to be up, so you’d better watch it soon. Why is the Sumatran rhino so hairy? A few days ago, I had a discussion on Facebook with someone about Sumatran rhinoceroses and why they were still hairy. I had posted one of Frans de Waal’s photos of a Sumatra rhino calf, and as calves go, it was very shaggy. The error is in assuming that a trait an animal possesses is always a benefit to it. This is a corollary of thinking the evolutions happens through natural selection alone, when it is actually only one way that it happens. (And it’s actually not the main way). The truth is the Sumatran rhino is nothing more– or less– than the last survivor a lineage of rhinos that retained their furry bodies of their tapir-like ancestors. (And Sumatran rhinos aren’t even that hairy!). 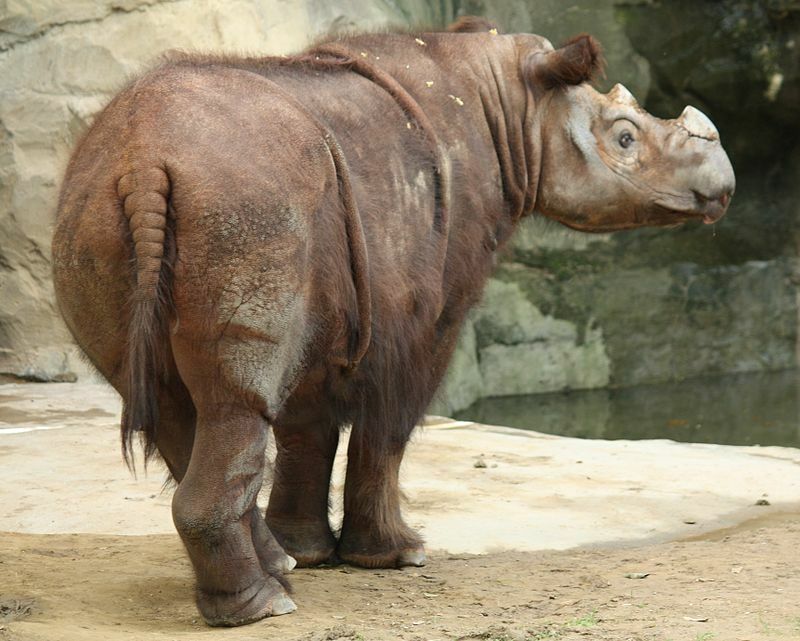 And it should be noted that there are plenty of mammals in the Sumatran rhino’s range that have much furrier bodies. Evolution isn’t planned out. It can only work with what genetic material is available in the population. Assuming that Sumatran rhinos retain their excessive fur only because it has some advantage to them is putting the cart before the horse. Now, there is a possibility that there is some advantage for these rhinos to retain the very furred up bodies. I’ve not seen any literature that explores this possibility, but the fact that this animal is so closely related to the woolly rhino kind of provides the best explanation. This animal retains a primitive trait solely because that’s what its ancestors were. It just can’t magically evolve a relatively hairless body. So always be careful in assuming that a trait exists solely because there is some advantage to it. 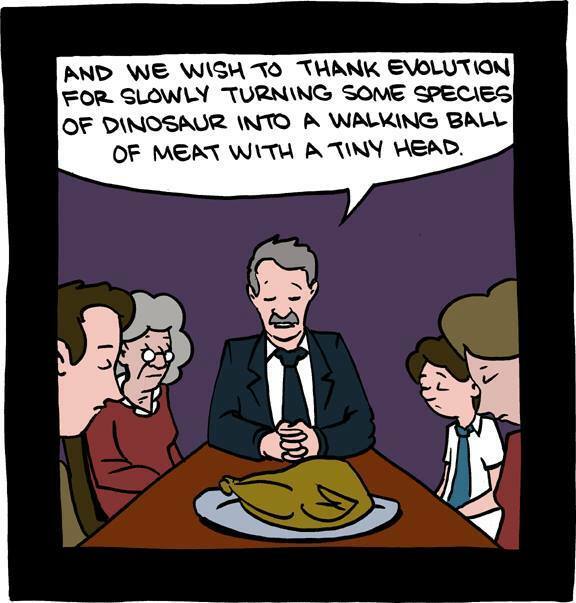 That’s a real problem in our popular understanding of evolution. Be very careful of putting the cart before the horse. Sometimes a trait is advantageous. It’s often just neutral. Not dinosaurs and not lizards either.